Have you ever seen such an unlikely pair of heroes in a children's book? A square middle-aged man and a discreet little dog. You would be perfectly correct to doubt the long-term potential of what may seem to be a suspectly bland duo. But you would also be perfectly wrong. 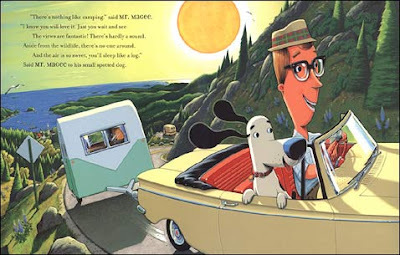 The Mr. Magee book troika (A Camping Spree With Mr. Magee, Down To The Sea with Mr. Magee and Learning To Ski With Mr. Magee) is one of the best modern picture book series available. Tonight we read A Camping Spree with Mr. Magee for the umpteenth time and - as always - it never fails to inspire. The Magee books are at the very top of our favourite read-alouds. 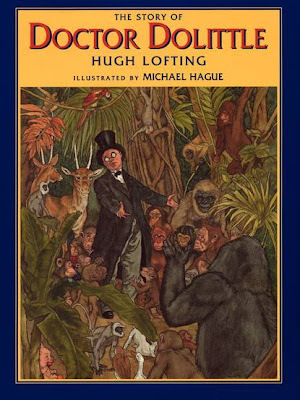 Although Van Dusen also illustrated the hyper-popular Mercy Watson series penned by Kate DiCamillo about a porcine wonder, the Magee stories are clearly superior as fables. The book is such a fantastic pleasure to read. For the reader and for the listener(s). Oh don't get me started on the visuals in this book. It is a testament to Van Dusen's fantastic artistic powers. This spectacular book in rhythimic rhyme simply screams to be read aloud to kids! It follows Magee and his pup Dee as they decide to go on a camping trip. After a whole day's ride they find the perfect spot on a hill above a brook that runs over a steep waterfall. While sleeping in the camper, a bear comes around. "A kindly old bear whose sight wasn't so clear. He couldn't see far and he couldn't see near". Trying to reach a bag of marshmallows, the bear unhitches the camper, which rolls down into the river and stops on a ledge above the waterfall. A drama with spectacular visuals unfolds above the waterfall. Finally, after the bear helps to save Magee and Dee, they decide to return home. Mr. Magee books are certainly not easy to create, Van Dusen published the three existing ones between 2000 and 2010. The last one came out just before Christmas 2010, so I guess the next one will be published in 2013/4. Until then - don't lose time - get a hold of the three existing Magee books. And then give your kids a real treat. Read them and laugh together! If you'd like to learn more about Chris Van Dusen, you can visit his home page at http://www.chrisvandusen.com/.